Buy America: Why Do Policymakers Keep Trying to Fix What's Not Broken? Once again, a faction of Congress as well as administration officials, responding to increasingly louder voices outside the industry, are calling for tougher Buy America procurement rules for public transportation equipment. And, once again, while on its face well-meaning, pro-jobs proposals largely ignore how the real marketplace works, and this weakness could undermine the very employment opportunities these proposals seek to expand. Worse, they could actually shrink them. The global market for rail technology — cars, equipment and systems — totaled $170 billion in 2010, rising to $207 billion by 2015, according to Statistica. This article will address the various proposals in detail, including their strengths and shortcomings. Before that, however, it is important to recap how we got where we are, including why U.S. policy has Buy America provisions in the first place. The origins of public transportation’s Buy America policies date back to the New Deal in the 1930s. Unemployment in the U.S. rose to 25%, which was actually better than many countries in Europe, where unemployment peaked at 33%, according to some histories of the episode. Heavy manufacturing industries were especially devastated, but so were agricultural sectors, which were also aggravated by the Dust Bowl droughts of the same decade. The economy of the U.S. as well as other industrialized economies underwent massive restructuring, and employment did not return to pre-Depression levels until World War II. Just as the New Deal program was being crafted to put Americans back to work, the Buy American Act of 1933 mandated that the steel, concrete and other basic materials used in federally funded projects be of 100% American origin. It applied only to direct purchases of these materials by federal government programs, not to projects funded with grants to cities or states. While a few public transportation projects of the New Deal also were subject to these narrow mandates, compliance was not raised as much of a problem for the industry’s suppliers at the time, including for rolling stock, traction power and other systems needed. These sectors were as strong as any in America at the time. Indeed, this was the beginning of the era of the Electric Railway Presidents’ Conference Committee (PCC) cars. Nearly 5,000 PCC cars were built in the U.S. and Canada during the late 1930s, 1940s and the early 1950s, according to APTA. In addition, many streetcar and bus companies were owned by local electric utilities, a market power that was broken up with the Public Utility Holding Company Act of 1935. Flash forward to the 1970s. The federal involvement in the industry had been growing, accelerating with the Urban Mass Transportation Act of 1964, the early post-war new rail starts and two foreign oil embargoes bookend the decade. In the midst of that turmoil, Congress also became concerned about the loss of jobs in U.S. manufacturing, including those employed by transit suppliers, and the need to stem that loss. Congress was also concerned about allegations of unfair trade practices by manufacturers that enjoyed protection and other preferences in their domestic markets, while U.S. companies did not have the same protections. Accordingly, Congress passed the Surface Transportation Assistance Act in 1978, which for the first time included a Buy America provision that expanded the coverage of the original Buy American Act to procurements with federal transit grants, with the following exceptions. The secretary of transportation could waive the rules if he or she determined that their application was “inconsistent with the public interest,” if their application to rolling stock “would result in unreasonable costs,” if “domestic suppliers were unavailable or of unsatisfactory quality,” or if the inclusion of the domestic components and materials would increase the cost of the procurement by more than 10%. Thus for the first time, the policy debate shifted from that of promoting and growing/restoring employment through public-sector investment to that of ensuring that domestic companies had a “level playing field” in an increasingly globalizing marketplace. As domestic manufacturing employment continued to drop, Congress has acted three times since the 1970s to toughen these rules. Ironically, the first of these attempts, in 1982, toughened the rules in some ways (it increased the price exemption to 25% for non-rolling-stock procurements, for example), it actually expanded the exemptions overall. For example, the 1982 law clarified, but weakened, the domestic content requirement that buses and railcars need only be 50% of the contract value and undergo final assembly in the U.S. Lawmakers toughened the rules for real in 1987, this time raising the content requirement for buses and railcars to 60% by 1991 and the price differential exemption for rolling stock purchases to 25%, same as for other procurements. This law also required pre-award and post-delivery audits to ensure compliance with Federal Motor Vehicle Safety requirements, as well as Buy America compliance, and to help grantees ensure that suppliers were complying with their own bid specifications. This law also introduced the Altoona-accelerated bus aging tests to ensure vehicles met their stated design lives and mandated that all buses purchased at least partially with federal transit grants undergo this testing. The law passed in 1987 thus represents the basic structure of Buy America law in place today. 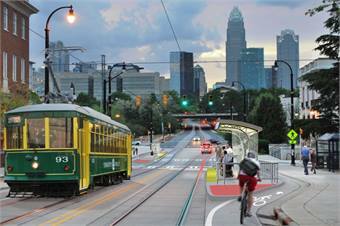 The FTA and the Department of Commerce’s manufacturing assistance programs collaborated to help the utilities find domestic components for the necessary utilities relocation as part of the Charlotte, N.C. streetcar project (rendering shown). Ever since the ink was dry on the FTA’s final rules implementing these provisions in 1991, the agency has been trying to strike a balance between enforcement of the tougher Buy America provisions, while also ensuring they do not create a “significant cost burden,” as also required by the 1987 statute. The “Dear Colleague” letters, and revised Buy America regulations implementing subsequent statutory modifications to previous policies, have also wrestled with this balance, trying to clarify what the audits should be looking for, what constitutes “domestically manufactured components,” for example, and what steps of the manufacturing process should be considered “final assembly,” among other related issues. Because many in Congress became increasingly concerned about FTA decision-making regarding Buy America waivers, the recently enacted Moving Ahead for Progress in the 21st Century (MAP-21) tightened the public notification requirements for these waivers. The FTA must now publish waiver requests in the Federal Register and post on its website detailed explanations of all proposed waiver determinations before they are made final. In addition, FTA is required to submit, annually, a report to Congress listing the waivers that it issued during the preceding year. A faction in Congress, as well as those in the Obama Administration, are not satisfied that the MAP-21 adjustments went far enough. The Administration has been tightening existing guidance where it can, while proposing new legislation where such actions are required. Some of their congressional allies want even tougher restrictions. In doing what it can without legislation, the Administration has issued a new interpretation of Buy America so the rules now apply to utilities relocation on highway and public transportation infrastructure projects. This move is unprecedented, as utilities and the companies that make the materials used in utility relocation have never been subject to Buy America before, says Jeff Boothe, managing partner in the Washington, D.C.-based law firm Holland & Knight, who also leads the Community Streetcar Coalition, whose members fear project delays or cancelations as potential results of this new interpretation. In a letter addressed to both then-FTA Administrator Peter Rogoff and then-Federal Highways Administrator Victor Mendez, a coalition of 11 industry groups, including those representing major utilities, urged the two agencies to install a transition period for the new implementation, so that compliance can be clarified, a waiver system can be stood up, and outreach and training for members of affected industries can be undertaken. “Most importantly, transportation projects can move forward [without delay],” the letter said. It added: “We believe utility relocations should not be subject to Buy America requirements during this transition period.” However, the groups did not oppose the application of Buy America requirements to transportation projects outright; on the contrary, they expressed their support in principle. Still, they issued this warning: Immediate implementation of the new policy “presents a substantial risk of having precisely the opposite effect” of what it hopes to achieve, meaning the new interpretation could result in fewer jobs. In the past, FHWA and FTA applied Buy America requirements only to the construction contracts to build a transportation facility. Buy America requirements were not applied to utility relocation agreements, because those agreements were treated as the equivalent of compensation payments to displaced property owners through land takings as necessary to build the project. Like affected property owners, utilities have little to no choice but to comply with relocation or abandonment orders and are typically required by state and local agencies to do so regardless of federal intervention. “In fact, until only this past year, FHWA and FTA never even mentioned utility relocations in Buy America regulations and guidance,” Boothe adds. FHWA has admitted the new policy is a shift from precedent, but it cites provisions in MAP-21 as the need for the change. FTA, however, does not acknowledge any change in policy, but instead argues that its new stance is simply an expansion of its existing enforcement responsibilities. In doing so, it says that its new guidance is effective immediately — nevermind that the agency has not even said how utilities can certify Buy America compliance. Nor does FTA appear to be sympathetic to any concerns about project cost increases or schedule delays. The utilities groups and project sponsors have said that many projects will almost certainly be delayed, not only because of the present uncertainty surrounding Buy America-compliance processes, but primarily because many materials and components used in utility relocation have long lead times, and some are currently not domestically available at all. The California Department of Transportation corroborates these challenges in exchanges with the U.S. Department of Transportation (U.S. DOT), and told the federal department that many large California projects that are likely to be delayed as a result. • Clarification of the requirements. • A reasonable transition period. • A timely, streamlined waivers process. • Consistent requirements for utility relocations across transportation modes. • Industry training and education. The sudden changes ignore another fact about utilities’ supply chains. These products must not just meet domestic content standards, but must be interoperable with their existing infrastructure and meet state, local and industry standards for safety, effectiveness and reliability. All of this will take time. 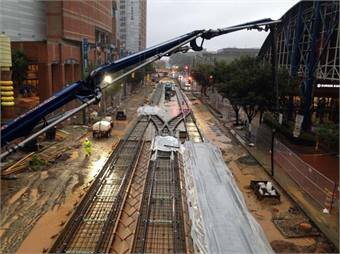 In their defense, the FTA cites the example of how FTA and the Department of Commerce’s manufacturing assistance programs collaborated to help the utilities find domestic components for the necessary utilities relocation as part of the Charlotte, N.C. streetcar project. However, those involved will also point out the project was delayed until those suppliers were identified, and the experience proves the delays the industry groups warn about are, if anything, likely elsewhere given the Charlotte episode. Since utilities have not been subject to Buy America requirements before, they will also very likely need waivers, at the very least during the near-term. For example, electric and natural gas utilities use many specialized products, which are critical to the safety and stability of the transmission and distribution systems, many of which are not available domestically. Thus, waivers are likely to be needed more frequently for utility relocations than for other transportation construction activities. Thus, if anything, some kind of waiver process is even more necessary than for rolling stock or other parts of the public transportation supply chain. FHWA has issued guidance clearly exempting some manufactured products; FTA has no such waiver process as of now. These disparities further complicate utilities’ compliance, creating the need for utilities to develop different accounting systems and different supply chains, one for highway projects and the other for transit projects. China and India alone account for 60% of all new global bus demand over the next decade, according to industry data. By contrast, the U.S. transit bus market averages around 5,000 units annually, in a global annual market of a half million units of all bus types. While federal agencies are doing what it can administratively to extend Buy America in unprecedented ways, both the president and many members of his party in Congress want to see significant changes to content requirements contained in the existing rules. The president, as well as several members of Congress in both the House and the Senate, have proposed legislation that would increase the domestic content of components and subcomponents to 100% of a procurement’s value. In fact, the only differences among these proposals are that some contain a phasing-in period, while others want immediate 100% content compliance. Regardless, the proposals “are unrealistic, and likely impossible to meet,” argues another letter being delivered to U.S. DOT officials, this one by the CEOs of the major bus and railcar builders and many of their major suppliers. The letter’s signatories represent the supply chains of more than 90% of the rolling stock purchased each year in public transportation that is at least partially funded with federal grant programs. These proposals “demonstrate a fundamental misunderstanding of the economics and logistics of our industry’s supply chain,” the manufacturers’ letter contends. The CEOs are referring to some inexorable facts that must be considered in crafting any regulations affect Buy America, not only for rolling stock, but also systems, professional services, or, as touched on earlier, newly applied utilities’ suppliers. This constant fact is this: goods and services markets, including those for public transportation, are becoming increasingly globalized. In fact, if anything, U.S. requirements are making the American market an island in worldwide system of oceans. To illustrate the sense of scale, China and India alone will account for 60% of all new global bus demand over the next decade, according to the Freedonia Group. By contrast, the U.S. transit bus market averages around 5,000 units annually, in a global annual market of a half million units of all bus types. This latter fact is important to remember because virtually all component manufacturers, such as engines, transmissions and smaller components, are in these other markets,and many are in trucking in automotive markets as well. In higher-tech bus markets, the U.S. share may be viewed as a leader, but is losing ground relative to the sheer size of non-U.S. markets. Annual sales of hybrid buses in China surpassed that of North America’s — Canada’s, Mexico’s and the U.S.’ — i n 2011, reaching almost 1,700 units according to Pike Research. This is despite the fact the U.S. has been a leader in this segment, thanks to federal funding. Orders of hybrid buses comprise 30% to 40% of annual transit bus sales, yet annual sales of hybrid buses in China surpassed that of North America in 2011, reaching almost 1,700 units. This is because the Chinese market is so much larger than America’s. Rail markets have comparable characteristics. The global market for rail technology — cars, equipment and systems — totaled $170 billion in 2010, rising to $207 billion by 2015, according to Statistica. Of those totals, the annual market for all of the Americas was $36 billion in 2010, or just over 21%, a share that will at best remain the same or shrink somewhat by 2015, according to Statistica. Because of these hard facts, some manufacturers worry these proposals will lead to decisions by some of their suppliers to abandon the U.S. public transportation market altogether, which depending on the supplier could lead to significant supply-chain disruptions. 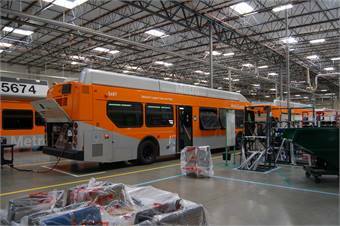 To illustrate, if the country’s only engine builder were to leave the market, it is possible buses might not be delivered at all, because so few manufacturers in the world make heavy-duty transit bus engines. Many of the others already entered the U.S market at least once before and exited, partly because of the regulations, but primarily because the U.S. transit market represents such a small portion of the global market. 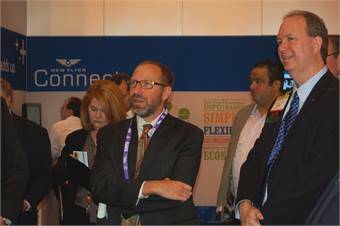 In a letter addressed to then-FTA Administrator Peter Rogoff (shown left alongside APTA President/CEO Michael Melaniphy), a coalition of 11 industry groups urged the agency to install a transition period for the new implementation of Buy America. Offshore companies currently doing business in the U.S. transit market have already invested millions of dollars in their American facilities, generating thousands of jobs. In other words, the existing 60% content standard works. Those who argue there is evidence that companies have often exceeded the 60% threshold for many procurements during the past decade and can comply with higher targets ignore why they did so. It wasn’t because of any procurement mandates or incentives, but because of market forces, opportunities and business decisions made aside from any procurement processes. For those who cite purchases that are recently funded by the Federal Railroad Administration, there are too many differences in that process to list here. Moreover, the very same favorable market forces mentioned above could in the future also turn unfavorable, and thus act to put pressure on manufacturers’ ability to meet even the 60% requirements — as they have at some times in the past. For those who want to stem the tide of waivers, the higher proposed domestic content thresholds will likely only generate more waiver requests. This is because, unlike non-U.S. markets, American bus and railcar manufacturing is fundamentally constrained, not only by the component availability issues raised above, but also by component specifications of their agency customers. Because of these factors, cost increases and procurement delays are inevitable if proposals set too high a bar for U.S. content. An overly restrictive Buy America policy also makes innovation more difficult, if technology transfer from other countries becomes more restrictive with higher U.S. content mandates. And, content mandates will also trigger a series performance re-testing measures that are also mandated by the transit agencies, which could lead to delivery delays, costs increases or both. According to one manufacturer’s estimate replacing suppliers with proper testing and validation can take between five to seven years in some market segments. If more Buy America requirements are not the best way to grow U.S. public transportation jobs, what is? The most proven way demonstrated time and again since the 1930s, and proven again since the early 1980s and 1990s, and even yet again with the landmark legislation of the past decade, is when demand for more bus and rail service is increased, generating demand for new infrastructure and rolling stock. Those who want to place greater mandates or structured procurement incentives on the marketplace may, in the long run, create fewer, not more jobs. The market distortions these proposals would cause will likely raise the prices or create delays for goods, services and projects delivered — which usually also means higher costs — or lower performance quality. Even if they are short-lived, these effects threaten to shrink job creation because fewer cars, buses and systems can be procured with the available funding and potentially undermine the political case for greater public transportation investment if the new rules undermine quality and performance. Three-quarters of all federal public transportation funding already flows to the private sector in the form of contracts, and the multiplier effect created in the form of additional jobs, local tax revenue and economic growth for the communities in which these businesses are located that these investments create is considerable. If new mandates undermined the public’s demand for greater transportation investment at a time when the industry could contribute real solutions to the world’s huge sustainability challenges, and thereby, create even more good-paying jobs, the lost opportunity would be a historic tragedy. As has been argued by APTA CEO Michael Melaniphy and others in countess testimonies and reports prepared for Congress, real, long-term job creation in public transportation comes with predictable funding, so that businesses can do better long-term growth planning. And no better guarantor of funding is a stable, solvent federal Mass Transit Account in the Highway Trust Fund, with sufficient dedicated revenues. Will we be global or parochial? The real question that must be answered is whether U.S. public transportation will embrace increasing globalization of the supply businesses by strengthening domestic demand, or employ a system of increasing incentives, penalties or a combination of the two that favor more parochial interests. Policymakers continue to ask themselves this question and no answer that is satisfactory to all emerges.